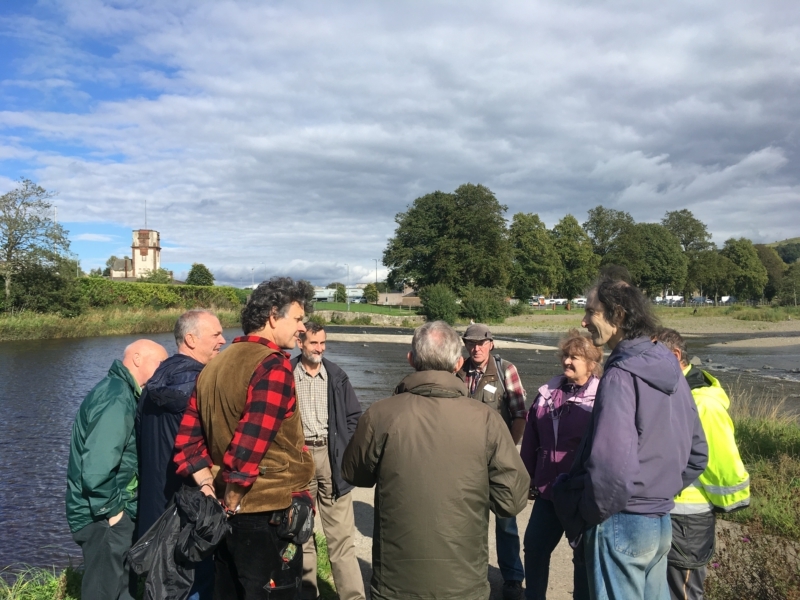 In September, Creative Carbon Scotland took part in River Ways: A Future Heritage for Hawick - a series of events exploring the cultural heritage of the River Teviot and the role that culture can play in building the future sustainability of the Scottish Borders. Organised by choreographer Claire Pençak and the Hawick Community Energy Group Ltd in partnership with Creative Carbon Scotland, Wilton Lodge Park and Alchemy Film and Arts, the programme included screenings of short films by the Moving Image Makers Collective (MIMC) inspired by the River Teviot, a guided river tour and a Green Tease discussion. 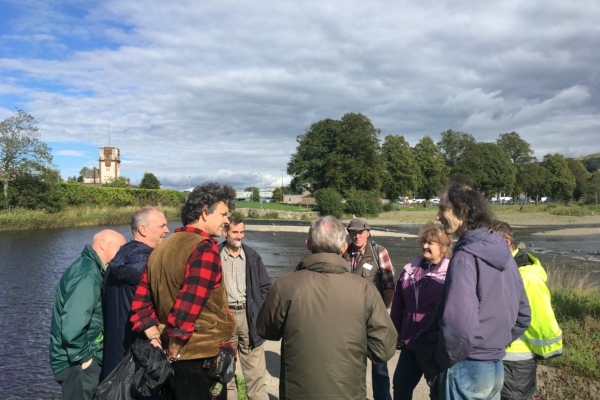 The context for Green Tease was set by Claire Pençak, highlighting that rivalry – from reivers to rugby – has and continues to define and shape much of the cultural heritage of the Tweed Catchment. 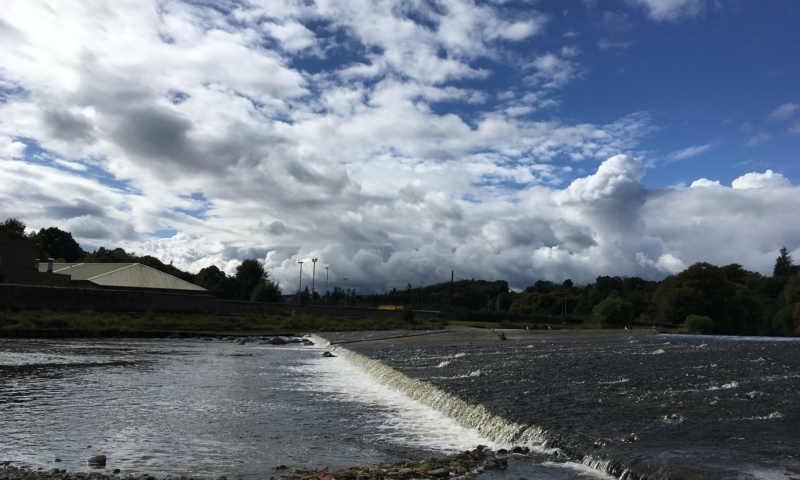 Regeneration projects are currently underway across a number of Scottish Border towns including a £3.6 million regeneration initiative in Hawick and a separate flood protection scheme which has brought into focus the town’s relationship to the river. Taken together these projects create a real opportunity for the Scottish Borders to transition to a more sustainable future, so how can the arts help shape a new culture of working together towards this change, a cultural shift? Louise Cox, Economic Development within Scottish Borders Council, who shared the council’s low carbon strategy which covers business competitiveness, quality of life, adaptation through infrastructure, and increasing community resilience; and her view of the council’s continued role in stitching together the work of individuals and communities on the ground. What are the opportunities for change in the Scottish Borders? What is needed to make these changes possible? Can we identify strategies that help shift cultures and speed up transformation? Going Forward: Suggestions for the near, far and infinite future. Movement and flow: increased possibilities for municipal/government to meet and exchange with grassroots/community levels. Need for more connectors bridging grassroots and top-down. Making the space for alternative ideas to develop. Creating a culture in which people feel encouraged to try things out, practice and develop ideas through informal processes and activities (rather than formal ones that can slow down, stifle or hinder ideas). Trying to remove the obstacles to this such as access to empty/unused spaces. Creating more of a culture of sharing rather than owning ideas and resources. Re-localisation. For example, a trial operating high streets differently to enable local people to shop locally (e.g. shift in opening hours so people can shop after work, electronic local shopping with collection points open after work). Finding, shaping and telling stories that help to make change. Working with creative writers, journalists, local papers to tell more and different stories. Through our culture/SHIFT programme, Creative Carbon Scotland is focused on creating opportunities for cultural practitioners to work with sustainability organisations to bring about wider change. The opportunities identified in Hawick echoed those explored during our recent T-lab workshop at the Transformations conference in Dundee in which we discussed the role of arts in the opening up spaces – both conceptual and physical – for different ideas and communities to come together to generate locally-grounded responses to complex sustainability-related issues. Similarly, our work with Frances Whitehead on the Embedded Artist Project foregrounds the strategic contribution which artists can make to decision-making processes through (amongst other things) their ability to synthesise complex facts, goals and ideas, and making explicit the implicit and visible the invisible. We look forward to continuing the conversations sparked during Green Tease and supporting the arts and sustainability network in the Scottish Borders. Thanks to all who participated and contributed to the event. More information about the Hawick Community Energy Group Ltd can be found on their Facebook Page. Green Tease is an ongoing informal events programme which connects creative practices and environmental sustainability. Our Green Tease Open Call is here to support cultural and sustainability practitioners and orgnisations to run your own events with support from Creative Carbon Scotland.